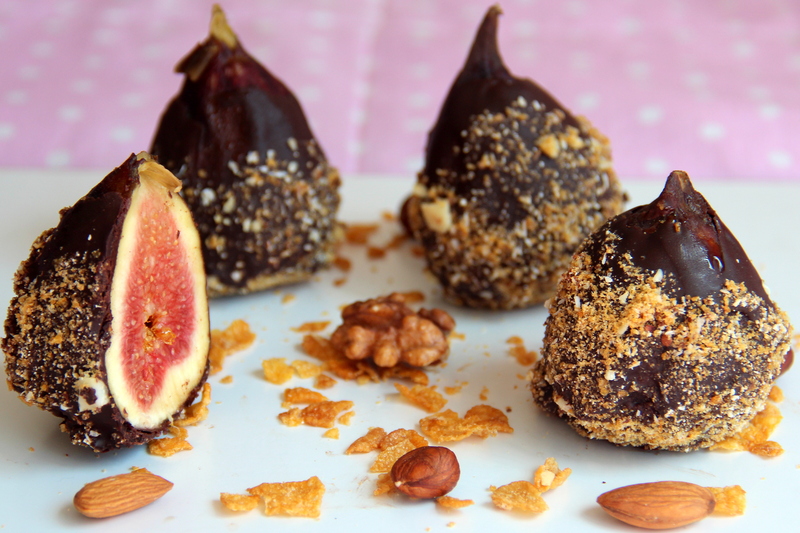 Fresh figs are dipped in melted dark chocolate and dipped in your favourite nuts/sprinkles. It can be served as a healthy treat. Chocolate, nuts and figs with Cornflakes instantly transform into a simple sophisticated dessert. One of the most impressive nutrients in fresh figs is its fiber. Fiber helps keep your digestive system working efficiently. A fiber-rich diet also helps lower your overall cholesterol levels. Eating a diet rich in fiber is also a smart way to lower your risk of type 2 diabetes, and potentially reduce your chances of getting certain types of cancer. Cornflakes can be crushed either in the food processor/blender. Line a large sheet tray with parchment paper and set aside. Transfer crushed nuts and cornflakes in a shallow dish and set aside. Break/chop into small pieces; place a double boiler (a saucepan filled with 1-2inches of water with glass/metal bowl over the top) over low heat. Do not over heat the chocolate; melt the chocolate just until smooth. Dip a clean and completely dry fig by holding the stem carefully into the chocolate, coating it about hallway up ( I like to use the spoon to help coat this) shake off any excess chocolate. Roll the bottom in nuts and corn flakes mixture and transfer to the sheet tray. Posted on August 13, 2014, in Appetizers, Indian, International, Kids recipes, Sweets and tagged Chitras healthy kitchen, drchdietfood, Figs coated with chocolate. Bookmark the permalink. 47 Comments. Will let you know for sure! Thanks Andy..a photo of the same will be an added bonus..
Oh my Chitra, love this. Figs are so good just about my favorite. Fig and chocolate is a wonderful combination. Beautifully done. We have a few figs on our tree now. Assuming they make it I will have to try this. Thanks for the idea! Oh Chitra, this is so amazing, what a fantastic idea, love it! Wanted to make my princess eat fresh fruits so tried this variation and she liked it. …thanx Vidya. …. Oh my gosh, I absolutely love this recipe! I love fresh figs and I love dark chocolate, and the two together sounds amazing. And they are so gorgeous! Also had no idea about figs and fiber – love that you include this info in your blog!! Thanks! Super easy and tasty recipe! Thank s a lot for sharing! They look marvelous! Stunning & ooh so pretty too! Like little jewels! Reblogged this on Your Vegan Recipes. That is an unusual combination for me. I’m going to have to try this, especially as figs are in season.